Chicago Metra launches COPS app – ELERTS Corp.
Our newest transit agency customer, Chicago’s Metra, launched its new Metra COPS app to allow riders to quickly and discretely report crimes, suspicious activity and other safety or security concerns to Metra Police from a train or station. 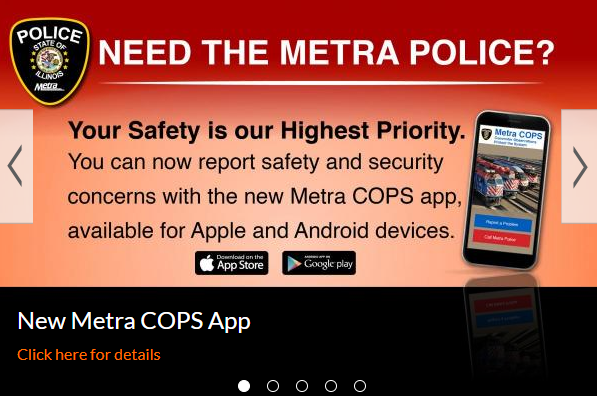 The app is meant for the reporting of safety and security issues on Metra trains and facilities, such as a crime in progress, disruptive or aggressive behavior, suspicious activity, unattended bags or packages, vandalism, panhandling, fare evasion or other concerns. (Customers are asked to not use the app for customer service issues, service disruptions or travel information.) Customers can send a description along with a photo and/or video of the issue being reported. The app automatically disables the user’s smartphone flash to ensure discretion, and reports can be made anonymously. The free app is available for Apple users in the App Store or Android users in Google Play. Metra Police dispatchers can respond to customers through the app, send out advisories and broadcast “Be on the Lookout” alerts to app users. Customers also can still report safety and security concerns to Metra Police at 312-322-2800.